Written by chris maroulakos on Friday, April 6th, 2012 at 9:00am. 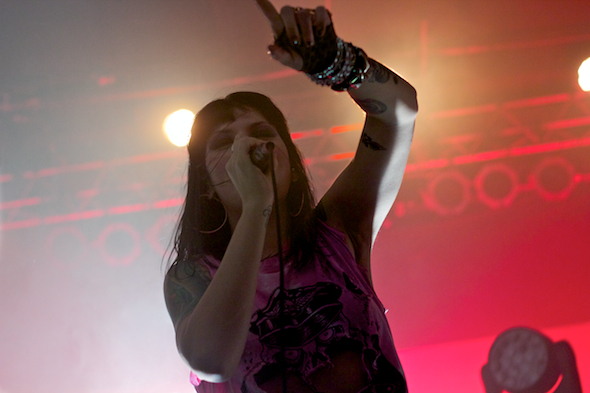 Tuesday night’s Sleigh Bells show at 4th & B was a laid-back, subdued affair. Shy frontwoman Alexis Krauss didn’t move around the stage much, and guitarist Derek Miller stuck to quiet, tasteful riffs that subtly enhanced the relaxed atmosphere. All in all, the concert provided a soothing experience for fans of restrained, discreet songwriting. Except, you know, not at all. The six Marshall full-stacks loaded like bullets on the empty stage provided the first hint that the show was going to melt some faces. Sleigh Bells began their set with a roaring rendition of “True Shred Guitar” as Krauss bounded across the stage, working the crowd like a crazed, demonic cheerleader. The duo — along with touring guitarist Jason Boyner — stretched 4th & B’s considerable sound system to its limits, with Miller’s metal-inspired riffs punching holes through any unprotected eardrum they could find. Her commanding stage presence seduced at least one fan, who dutifully removed his shirt as an offering to the singer. Without missing a beat, Krauss removed her own shirt to put the new one on. Judging from the crowd’s appreciative response, no one minded the onstage wardrobe change.